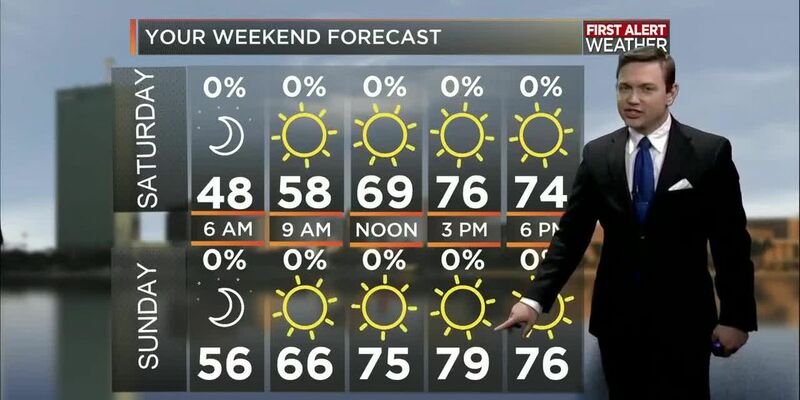 LAKE CHARLES, LA (KPLC) -Through the rest of the afternoon expect sunny skies to stick around and remain clear overnight. That’ll help temperatures to cool down into the mid to upper 40s overnight. 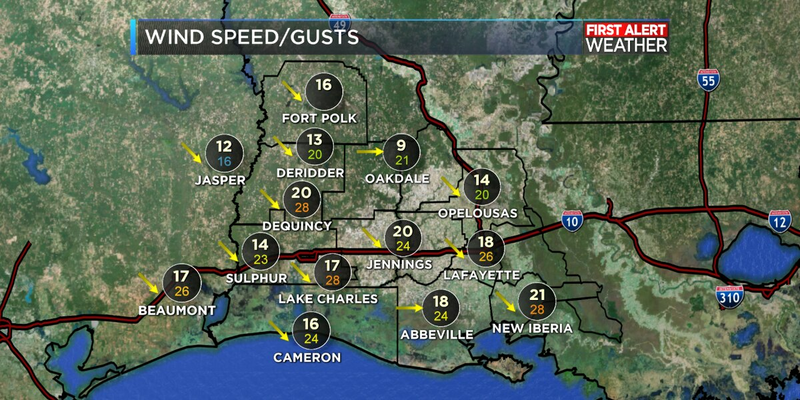 We also have pretty breezy conditions outside with winds gusting up to 30 mph at times, but the good news is that winds are out of the north so humidity is low across SWLA. Starting off our work week similar to today. We’ll see sunny skies and temperatures starting off in the mid to upper 40s. Definitely will want to grab a jacket before heading out the door. We’ll warm up nicely through the afternoon with ample sunshine to the low to mid 70s! Clear skies stick around through the evening, but then we start to see cloud cover increasing to start Tuesday. Tuesday starts with a mix of sun and clouds and temperatures in the mid 50s. We’ll see that cloud cover gradually increasing through the afternoon winds shift out of the south and humidity returns as well. This southern wind will help temperatures reach the upper 70s through the afternoon and will help keep lows from falling too much. We’ll bottom out in the mid 60s as we start Wednesday. Cloud cover sticks around Wednesday with SWLA remaining dry through the majority of the day, but that changes into the afternoon and evening hours as our next cold front approaches the area. We’ll warm to near 80 through the afternoon before falling back into the upper 60s overnight with showers and storms increasing. 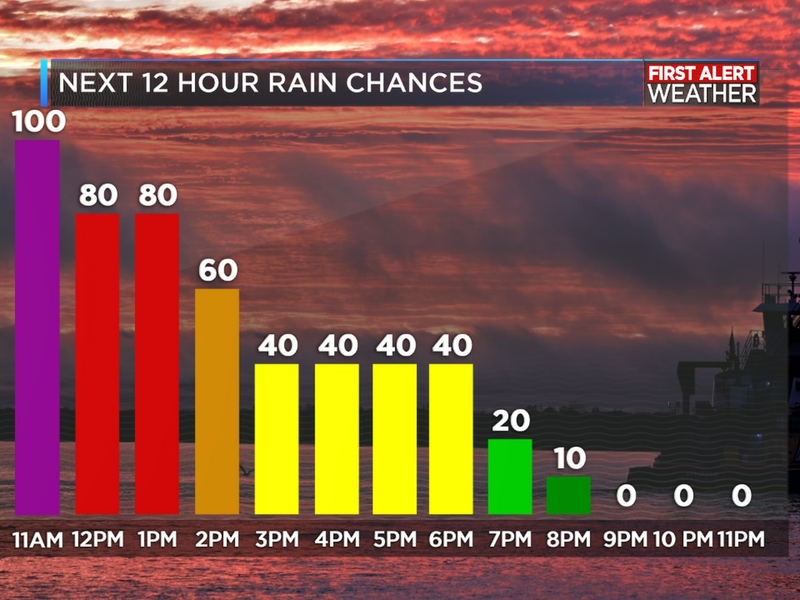 That main chance for showers and storms looks like it happens overnight into the day on Thursday. Which means everyone needs to stay weather aware through the evening and have something that can wake them up in case of a weather emergency. We are already watching this system for the production of severe weather as conditions look like that could be ripe for some stronger to severe storms. 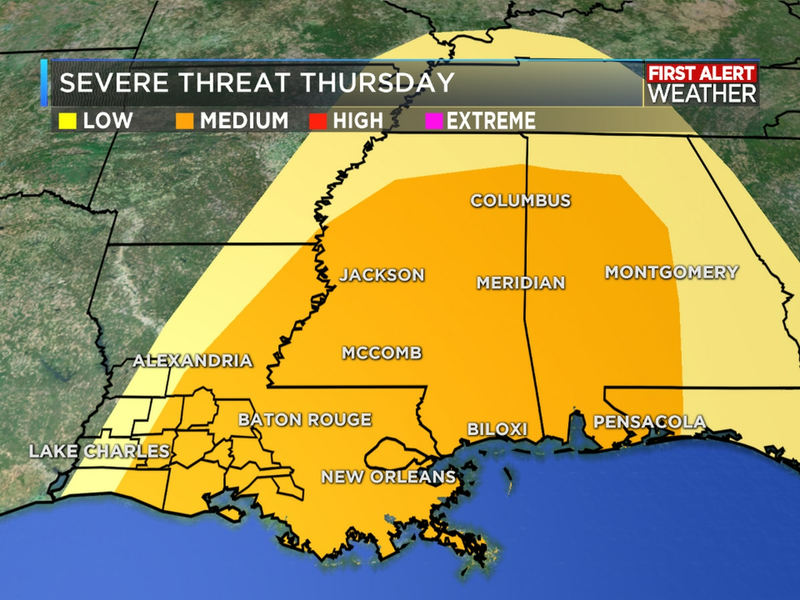 These storms stick have the potential to linger through lunch time on Thursday before finally moving out of the area. We’ll then see temperatures start to fall as that cold front sweeps through and continue to fall into the evening hours down to the mid 50s overnight. Friday starting off with clear skies as that cold front clear us out nicely and temperatures down into the mid to low 50s overnight. 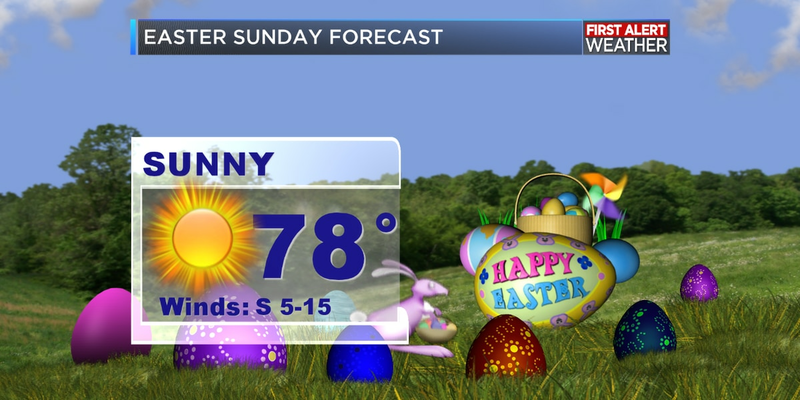 We’ll see plenty of sunshine through Friday and into Easter weekend! With temperatures steadily warming to near 80 degrees by Monday. 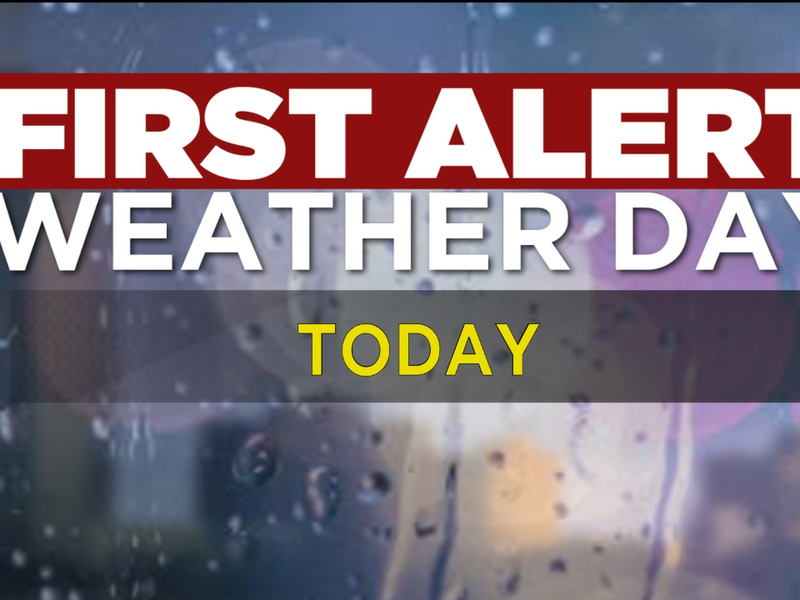 Gabrielle graduated from Mississippi State University in 2018 with a Bachelor of Science degree with a concentration in Professional Broadcast Meteorology. She has interned multiple summers with local government agencies, including with the parish president and with the director of Homeland Security and Emergency Preparedness in her home parish.